Home > Calling all Corporate and Social Event Planners and Concierges! Lakeshore Sport & Fitness-Illinois Center will be hosting a complimentary event for you! Looking for new and unique venues to host events or send clients? LSF is downtown Chicago’s hidden gem and is a beautiful 7-story facility with rooftop patio/pool, in-house catering and fun event spaces! Whether you plan large or small, corporate or private events, LSF has the capacity and offerings you need! 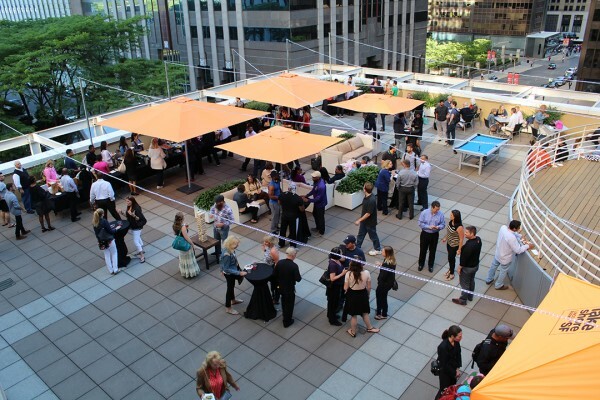 Join us this May for a complimentary evening of food, drinks, and a fun atmosphere on our rooftop deck. See below for details. Space is limited. All guests must RSVP below. – Team building events including dodgeball, bubble soccer, rock climbing and more! – Sporting tournaments including basketball, volleyball, bags and more! Location: Lakeshore Sport & Fitness-Illinois Center at 211 N. Stetson ave.